EDEN'S CURSE: "Unbreakable" nuevo adelanto de su directo "Live With The Curse"
EDEN'S CURSE: "Evil & Divine" nuevo adelanto de su directo "Live With The Curse"
EDEN'S CURSE: detalles de su nuevo disco "Cardinal"
Eden's Curse lanzará su quinto disco de estudio "Cardinal" a través de AFM Records el 14 de octubre de 2016. El disco fue producido por Paul Logue y Thorsten Koehne. EDEN'S CURSE: nuevo tema "The Great Pretender"
EDEN'S CURSE: nuevo tema "Unconditional (feat. Liv Kristine)"
Para celebrar el décimo aniversario de su álbum debut, Eden's Curse, lanzará "Eden’s Curse - Revisited - CD/DVD", un pack formado por el su disco debut regrabado en su totalidad y un DVD, "Live In Glasgow - The Official Bootleg" el 25 de agosto a través de AFM Records. El DVD fue grabado en la sala "The Classic Grand" en Glasgow el 28th de noviembre de 2014, es el mismo concierto del que editaron el CD "Live With The Curse". day Edguy, EDEN’S CURSE were warmly received by the global Rock & Metal press and public alike. Fast forward to January 2016 and EDEN’S CURSE celebrate a decade together and in October of that year they released their fifth studio album 'Cardinal' on AFM Records. To celebrate the tenth anniversary, AFM Records and EDEN’S CURSE hatched a plan to re-record the classic debut album in its entirety. "The first album really was the foundation for all that was to follow. Ever since Nikola joined the band we have been inundated with requests to re-record some of the older material and whilst it would be great fun, it would also be the same amount of work as recording a brand new album.” says bassist Paul Logue. Coupled with the re-recorded debut album is the 'Live In Glasgow - Official Bootleg DVD' which is the 'Live With The Curse' live album recording show in its entirety. Filmed at The Classic Grand in Glasgow on 28th November 2014, the release marks the band’s first official live DVD release, albeit in a bootleg form. "The footage is absolutely excellent" states bassist Logue. "We did not intend to film a DVD, but the audio recording company brought two cameras along to capture the show and when we saw the results we were really surprised!“ he adds. 'Eden’s Curse - Revisited' is the ultimate package for EDEN’S CURSE fans old and new and a fantastic introduction to the band's music. It's a true celebration of the record that started it all, from the guys who carry the legacy forward. Over 60 mins of music and 100 mins of film make 'Eden’s Curse - Revisited' a must have for all Eden's Curse & Melodic Metal fans! EDEN'S CURSE: nuevo tema "Fly Away (2017 Version)"
EDEN'S CURSE: nuevo tema "Fallen King (2017 Version)"
EDEN'S CURSE: nuevo tema "We All Die Young (2017 Version)"
El nuevo trabajo de Eden's Curse, "Testament - The Best Of Eden's Curse", será lanzado por AFM Records el 2 de noviembre de 2018, se trata de un doble CD que recorre sus cinco álbumes de estudio, también incluyen una nueva canción titulada "Forever". 14. 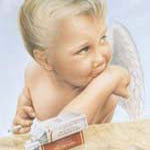 Angels & Demons (Featuring Pamela Moore) Mixed & Mastered by Dennis Ward. Eden's Curse to release "Testament - The Best Of Eden's Curse"! 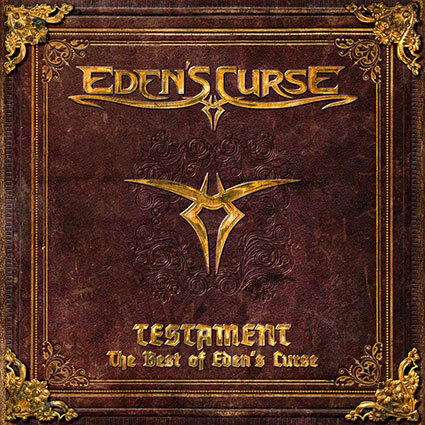 Eden's Curse are delighted to announce the details of their new release 'Testament - The Best Of Eden's Curse'. 'Testament – The Best Of Eden’s Curse' will be released by the band's long time label AFM Records on 2nd November 2018 and is a two disc CD set that features 14 songs, covering all five studio albums, on CD1 and a bonus disc 'The Best Of The Bonus Tracks' on CD2, which includes a brand new song 'Forever'. 'Forever' will be released as a single/lyric video on 12th October 2018 and was written by Paul Logue and Thorsten Koehne, mixed by the band's former drummer Pete Newdeck (Midnite City, Tainted Nation, Steve Grimmett) and mastered by Harry Hess (Harem Scarem band).